The right advertising specialty or promotional item will keep your company’s name in front of your customer for weeks, months or even years. To help you find the perfect item, we offer the best selection of innovative and cost-effective trade show and event giveaways—everything from key chains and pens to hats, golf bags and much, much more. 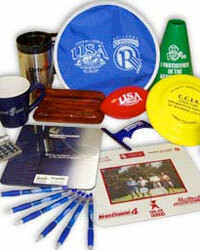 Advertising specialties and promotional items help you get remembered. They are ideal for gifts, thank yous and giveaways for trade shows and events. We can personalize just about any item from pens to mugs and just about everything else. Long after the trade show is over or the sales call is over, your organization's name and contact info remains with your customers and prospects.